The theme of Eva’s summer camp this year was “MOGs” or “moments of growth.” She had many MOGS during the summer. Apparently among the kids it became the thing to say, when something amazing or interesting or challenging happened: “MOG!” It was like this summer’s YOLO at Jewish summer camp. I noticed that Eva did grow a lot this summer. I love the intellectual and spiritual curiosity I see in her. When we were on a family vacation to Boston we arrived at the Museum of Science to find that unbeknownst to us, the Dead Sea Scrolls exhibit was temporarily there. I had wanted to go a couple of years earlier when it was in San Diego but missed it. At first she was unenthusiastic. We’re at this huge, fun, kid-oriented museum with tons of hands-on exhibits, and I want her to spend part of her day walking through something reminiscent of all those tedious hours in Hebrew school? But I didn’t give up. I bought the extra-admission tickets for the exhibit for Eva and me. Scott and Jane started their day in the regular part of the museum without us while we grabbed a quick snack then headed up to the exhibit. Here’s where the MOGs kicked in. From the moment we walked toward the exhibit and she saw Hebrew writing (that she could read!) on the walls, she was excited. In the ante-room, our guide gave a quick two-minute speech about the significance of the time period of the scrolls to Judaism, Christianity, and Islam, and she was enthralled. She even asked the guide questions. Then, going through the exhibit, we TALKED. We talked about how amazing it is that tefillin were found in the caves where the scrolls were found. Millenia ago our people were doing the exact same thing that her slightly-older peers at Camp Ramah learned to do this summer. We discussed how amazing it is that “holy” and “wholly” are from the same derivation. Does making things “holy” bring about “wholeness”? And the word for holy in Hebrew is kadosh, which in Hebrew has more of a meaning of separation or setting-aside, and what are the similarities and differences between the two. Does that mean that a native English speaking Jew internalizes holiness differently than the ancient scribes who wrote these scrolls? She fell in love with the mezuzah case in the previous post. It was in the gift shop as we walked out. My suitcase (which had all of our trip souvenirs including the mezuzah case) took a detour to cowboy country (Cody, Wyoming!?) on the way home and for a moment there we thought the pretty Jerusalem mezuzah case was gone. But my suitcase arrived, mezuzah case intact! 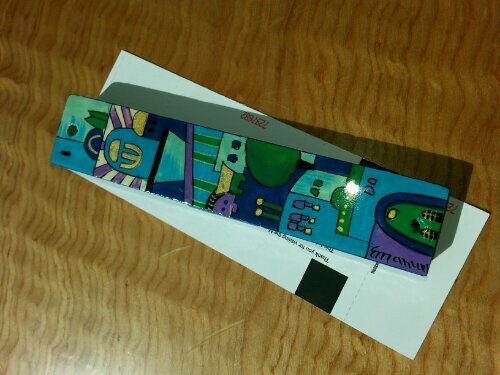 Eva got this new mezuzah case at the Boston Museum of Science in the Dead Sea Scrolls exhibit. Now that’s a souvenir she’ll actually use for a long time.